Meet Sowmya. A fellow blogger and a sweet friend. 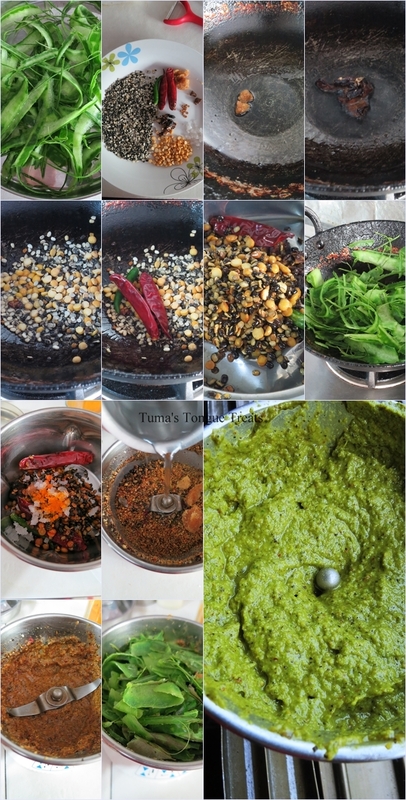 Her blog Tuma’s tongue Treats is full of hearty, scrumptious recipes which she loves to prepare for her small family based in Singapore. Most of the recipes on Sowmya’s blog are inspired by her South Indian Tam-bram roots. When I asked, she kindly agreed to do a guest post for TVI. And has brought over this super healthy and easy chutney recipe, which is made of ridge guard’s peels. What!? I could have never thought of that. Honestly! Ridge guard is also known as Snake guard, Turai, Nenua etc. depending upon the region and local language. And it’s a powerhouse of essential vitamins and minerals, and also a low-calorie vegetable to have. Sowmya has given more information on its benefits and method below. Hop over to her yummy blog for more such unique and healthy recipes. Would I miss an opportunity doing a guest post when the invite from a popular blogger and Foodie? NO. And YES. I am here. A warm Namaste to all the readers of The Veggie Indian. I am Sowmya, married and settled in Singapore with my husband, little angel ‘Vishwaja‘ and my In laws. I own and blog at “Tuma’s Tongue Treats” – my passion and obsession presently. The main reason for my interest in food is because of my educational background in Nutrition. Besides cooking, my other hobbies are singing, dancing, painting, sketching and creating glass art. That is about Me in short. I am very happy to be a guest today on Nupur’s space and I thank her for having invited me over to share her space today. I have always been a fan of her recipes and never missed any of her posts . Her content and vibrant photography with intricate detail on nutritional facts on food has always impressed me and that kick started our friendship. It is almost 4 yrs now and am glad to have found such a warm, pretty and talented person on blogosphere. About today’s recipe….. Nupur had suggested that it would be nice if I gave her some traditional South Indian recipe. After some thought process, I zeroed upon Thuvayal/ Thogayal. Thuvayal – if exactly anglicized would be Chutney with roasted dhals and spices being the major components. It is a popular accompaniment in South Indian cuisine, easy to prepare and are time savers. A very small serving can make a meal very tasty on days when fresh food stock is scarce. The most popular ones being Thengaai Thuvayal ( Coconut Thuvayal) and Toor Dhal Thuvayal( Paruppu Thuvayal). The recipe has eventually evolved over years in different regions and households. Interesting additions like vegetable pulp and vegetable peel along with dhals make it innovative, tasty and also increases the nutritional value. Wash and peel Ridge-gourd. Set aside. Use the gourd for preparing any dish of your choice. Collect all the dry ingredients ad keep aside. Heat 1 tsp oil in a Kadai/pan. Fry asafoetida flakes until it softens and puffs up. Drain and set aside. Fry the tamarind. Drain and set aside. To the same Kadai add 1 tsp oil and add all other ingredients except chillies. Once everything is coated in oil, throw in the chillies and roast until the dhals turn a deeper brown and the chillies puff up. Take care not to burn the spices. Keep the flame low-medium always. Transfer everything to a plate and let it cool. Saute the peel in the kadai until it wilts. 2 minutes. Switch off and set this separately. Collect the roasted dhal in a mixer, add salt, turmeric and pulse to break down to bits. Add little water, jaggery and pulse again to make a coarse paste. Add the wilted peel and pulse to make a coarse paste. You can add 1 tbsp of sesame oil and mix well – This is optional. Mix 2 tsp of Thuvayal/ Chutney with rice and ghee and serve alsong with any dhal curry. Or serve this as an accompaniment with any main course. Goes well with Dhal curry, Curd rice and also Idli and Dosa. Thuvayals and Chutneys taste best when consumed on the same day. However, you can store it in the refrigerator for one day. You can also replace split Urad dhal with whole with or without skin. Increase red or green chilli according to spice needs. If you prefer, saute 1-2 garlic flakes/ shallots along with the spices. This is completely optional. That’s a lovely guest post Sowmya.. And chutney looks scrumptious.. Can have with Molagootal !! Thank you Sandy. True . We all love Thogayals with Kootu.